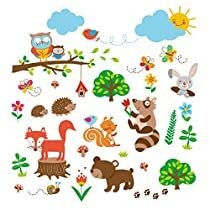 Come into the woods to meet sleepy owls, frolicking foxes, and curious bear cubs enjoying a smiley sunny day! 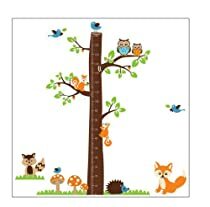 A sweet bunny, happy hedgehogs, and many other friendly forest friends peek out to meet your little one in a colorful scene filled with bright flora and fauna. These were easy to install and affordable! They are cute, colorful and unisex. Although it comes with plenty of stickers, we are ordering another set because his walls are still looking a little bare. Product is as described, very vibrant colors. 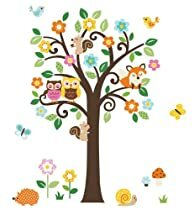 I used this on a wooden dresser as decorations for the nursery, definitely a cheaper option than buying a baby dresser. They adhered well to the clean painted wood, with the use a "plastic scrapper" to smooth the vinyl over (pretty typical for decals, you can use a credit card too). Love it! Very cute and the paint won't peel off when you're moving out. Comes in 4 sheets. We placed them on the walls next to each of our baby's changing stations so we can distract him with something when he's wiggling while we change him.